It’s a Bird!…It’s a Plane!…It’s Sventa Claus! 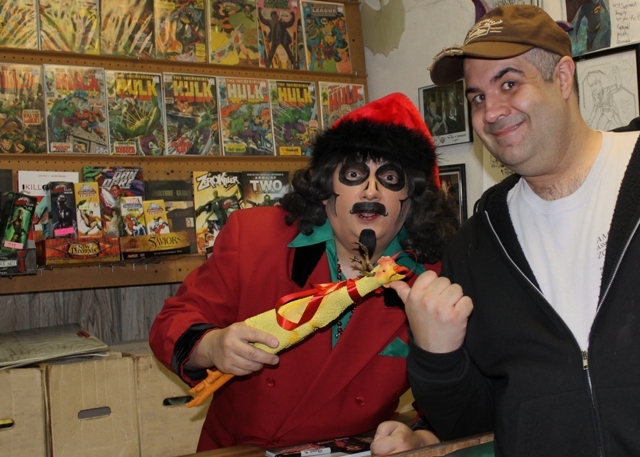 National Horror Host, Svengoolie, made his annual holiday appearance at the “Comic Collector” in North Riverside, Illinois this past Friday and marked the occasion with an ALL-NEW Sventa Claus suit! 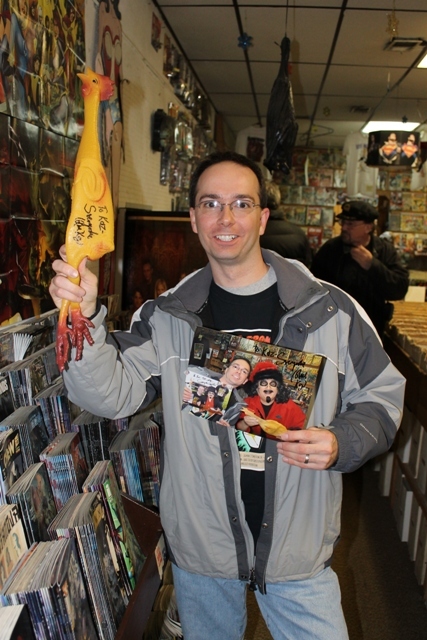 The Comic Collector has been a popular location for many Chicagoans to get their comic book fix for over a quarter of a century and its owners, Rich and Regina Lukes, have been Svengoolie fans for just as long! 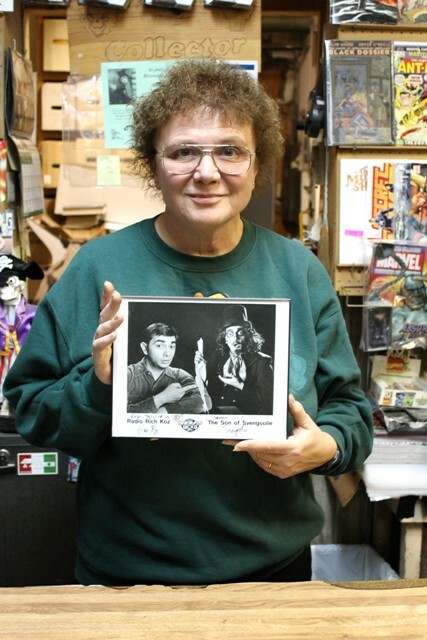 Regina Lukes shows off her old Son of Svengoolie autograph! With 15 long boxes of comic books currently in my basement, it had been a long time since I’d been a collector. Back in the early 1980’s, when Spider-Man got his new set of black, alien duds (via the awesome SECRET WARS limited series) I got hooked on Marvel Comics. For the next 15 years I was an avid reader of Spider-Man, The Uncanny X-Men, X-Force, The Mighty Avengers, Iron Man, and Captain America. My favorite of all, of course, was ROM: Spaceknight which I featured HERE. 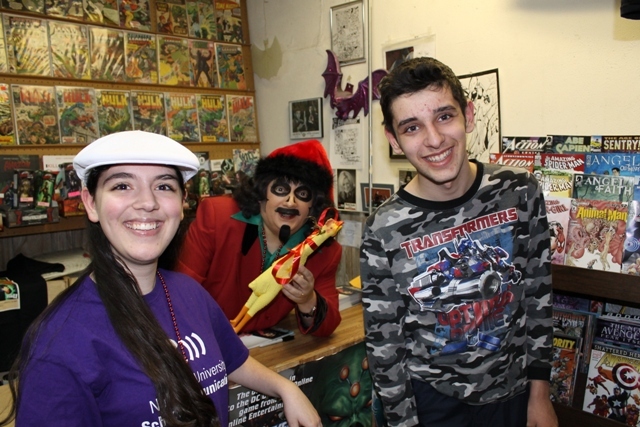 Svengoolie, as it turns out, is no stranger to comic collecting either. 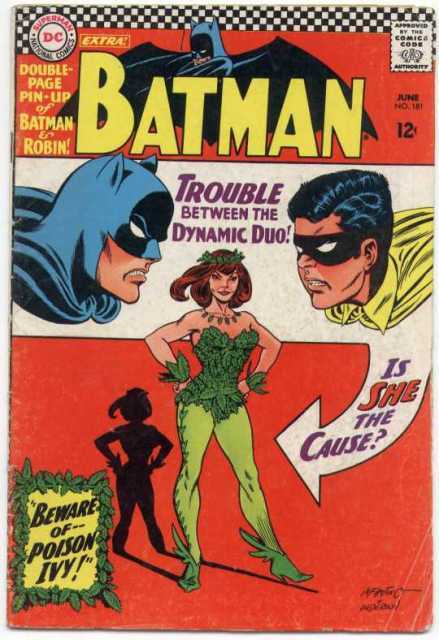 In fact, he boasts some impressive issues in his collection such as first appearances of Detective Comics (DC) Batgirl and Poison Ivy! Later, Sven would also start collecting Marvel Comic titles such as Daredevil and Captain America! I arrived at the store just before his arrival. This is one of the few instances where Svengoolie makes an appearance without his assistant, Jim Roche. As I walked into the store, I noticed a line had already formed. While waiting in the front of the store (back of the line), in walked two familiar faces! Ron and Angela Urban have been long-time Svengoolie fans and I had the privilege of meeting them at DAYS OF THE DEAD back in early July. 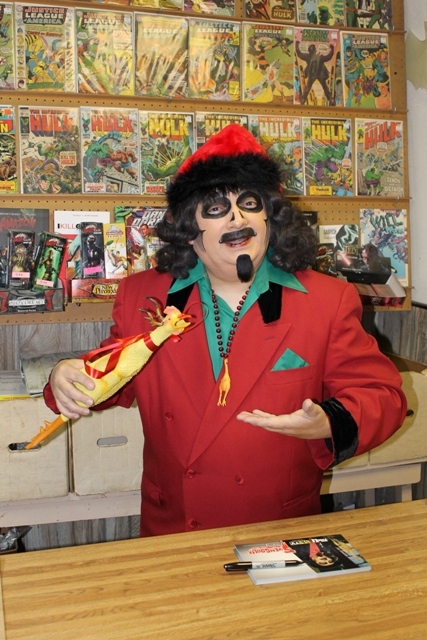 Angela is a treasure trove of Svengoolie info and I am hoping she will share some of her great Son of Svengoolie/Svengoolie pictures and memories with us here! She’s also a crafty sort of a gal and Sven fans who watch the Mail segments have, no doubt, seem some of her handiwork. Among her many creations she’s made a Svengoolie Christmas Tree and, most recently, a Svengoolie mailbox! We soon found ourselves in front of Sventa Claus! 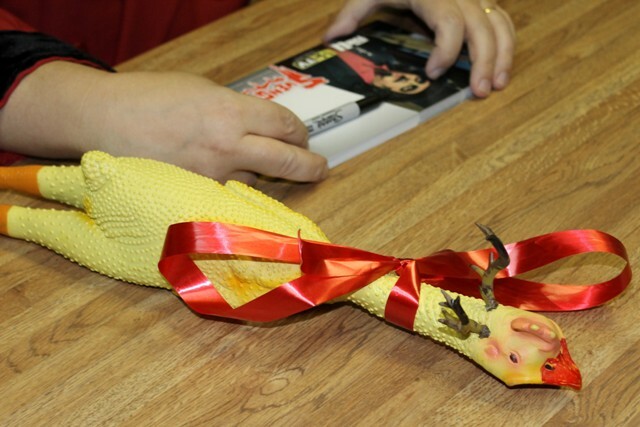 Rudolph the Red-Beaked Rubber Chicken – created by Sventa, himself! After some ho9liday greetings and compliments regarding his new seasonal attire, I discussed with him his love of comics while complimenting him on the great parody songs his show had featured of late. We all posed and then moved to the side so others could come and meet Sventa! 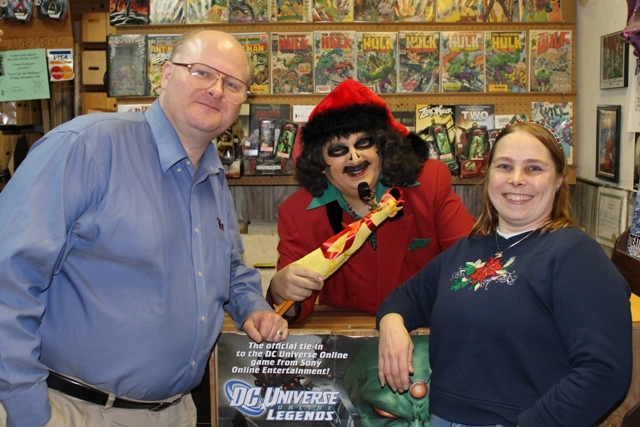 Svengoolie with Ron & Angela Urban! We hovered to the side chatting while other fans got to meet Sven. 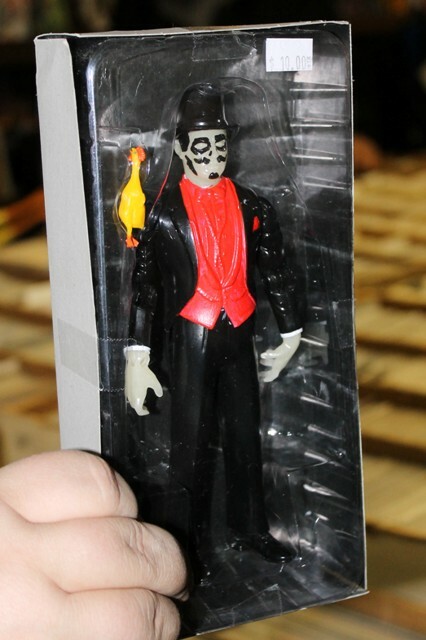 I always enjoy seeing what fans bring to have signed and the most interesting was a Glow-in-the-Dark custom Svengoolie figure some guy bought from Horrorbles in Berrrr-wyn! Another fan, named Kaz Young, brought an 8×10 of his Sventa Claus meeting from last year! To Kaz from Koz…sorry I couldn’t resist. 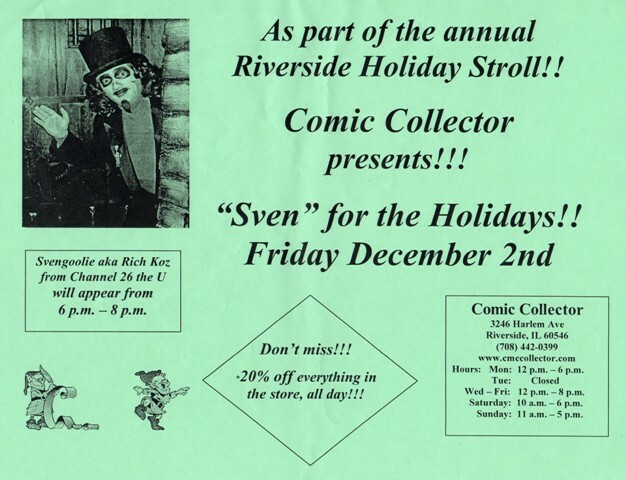 In fact, this particular Sven appearance was a veritable “who’s who” of Svengoolie fandom! Both the Urbans and I lit up like Christmas Trees when we saw Jamie Lee Cortese enter the store with her family! Of course I almost didn’t recognize Jamie without her signature Svengoolie-gal suit. I casually mentioned to her that she should definitely try and make a female version of this holiday costume for next year! Of course I was just kidding (no, not really – Jamie, PLEASE do it!). The Cortese kids and Sventa! The line kept going and we eventually found ourselves making complete orbits around the whole the store before finding ourselves back in front of Sven. Svengoolie was kind enough to utilize one of these brief lulls to film a little promo for us here at TERROR FROM BEYOND THE DAVES! Close to the end of Sventa’s visit, the Gregulas walked in! I hadn’t seen them since DAYS OF THE DEAD so we caught up before it was their turn to meet Svengoolie! It ended up being a wonderful night and I stayed the whole two hours (which went really FAST). After I returned home, I dusted off my old boxes of comic books and perused some of the old titles. I remembered back when they were 60 cents each and how excited we’d get when my mom agreed to drive us to a comic shop (the closest one when I was 12 years old was about 30 minutes away). 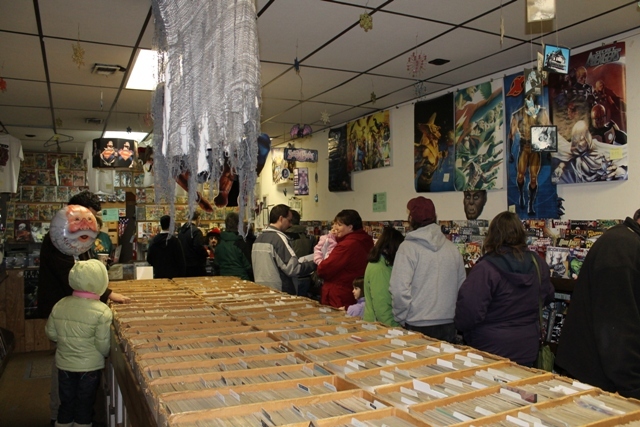 I imagined how cool it would have been to have had The Comic Collector nearby during that time. This entry was posted in Holiday Horror, Horror Hosts, Stalking Svengoolie! 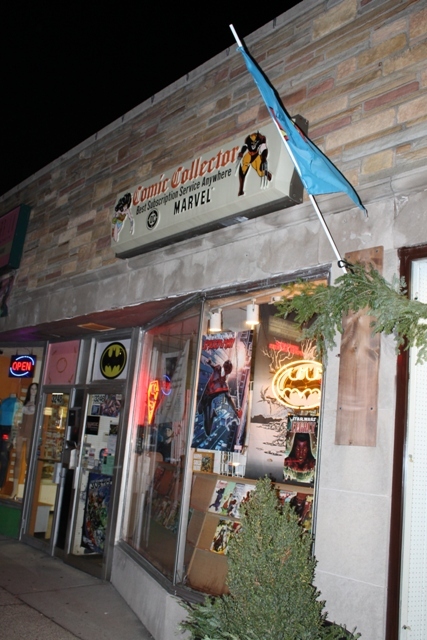 and tagged "The Comic Collector", COMICS, Son of Svengoolie, Svengoolie. Bookmark the permalink. ← Dog-gone but never forgotten: Whatever Happened to Wolfman Mac?